When a sow kicked a heat lamp into the straw one cold January night in 1954 and burned down the barn on the Carroll County farm where Lynn Dobson’s family lived, no one imagined how much impact the blaze would have. It became a defining moment for Dobson, however, even though he was only four years old at the time. Dobson admits he enjoyed building things much more than farming. That didn’t mean he didn’t have his share of chores to do on the farm, however. His father liked raising livestock, so there were usually eight to 10 milk cows to care for, along with feeder calves, hogs and chickens. 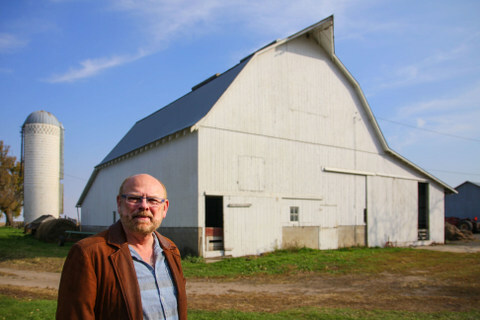 In fact, the barn was built for milk cows, said Dobson, who noted that Bill Troxel from Lanesboro picked up milk from the farm. 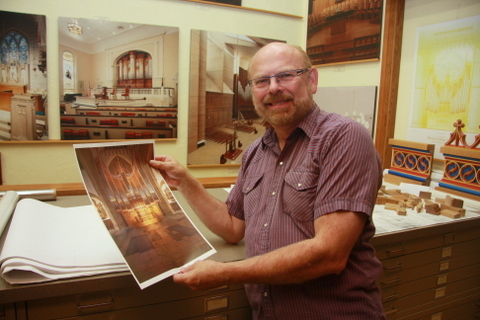 Lynn Dobson designs grand pipe organs that grace churches in small towns like Lake City, Iowa, to cathedrals in New York City. Other activities inside the barn were much less threatening. Dobson enjoyed playing in the barn with his sisters and building forts in the straw bales. Sometimes he climbed the ladder that extended to the peak of the roof. “I’d catch little pigeons and try to tame them and raise them as pets,” he said. The barn was always a hub of activity, Dobson added. While Elmer Dobson phased out of the dairy business in the early 1960s, he continued raising hogs and farrowed sows in the barn. He maintained his livestock operation for many years until he and his wife, Muriel, retired and moved to Lake City in the early 1980s. After Dobson graduated from Glidden High School in 1967, he studied art at Wayne State College in Nebraska, where he earned his undergraduate degree in 1971. In 1974, he established Dobson Pipe Organ Builders, which recently designed, built and installed a customized pipe organ for the 2014 observance of the 750th anniversary of the founding of Merton College at Oxford, the oldest university in the English-speaking world. 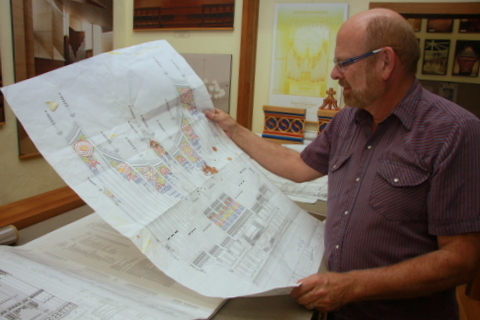 Note from Darcy: I wrote this feature below on Dobson Pipe Organ builders in 2013. 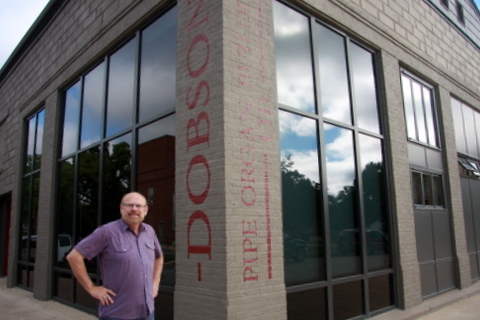 Donald Hobbs, a long-time employee at Dobson Pipe Organ Builders in Lake City, helps create the masterpieces that the company builds for clients worldwide. 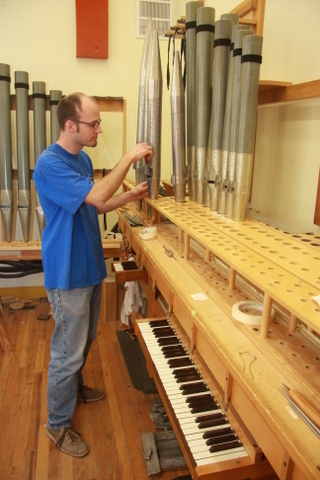 A former John Deere shop has housed Dobson PIpe Organ Builders for years in Lake City, Iowa. The journey that started on a farm near Lake City has taken an Iowa pipe-organ company international, thanks to the creative vision and entrepreneurial skills of Lynn Dobson. Made of quarter-sawn white oak from the southern United States, this masterpiece (known as Opus 91) rises 46 feet tall, stretches 26 feet wide, weighs about 16 tons and features hand-carved designs. It also contains nearly 3,000 pipes, which range in size from a drinking straw to a telephone pole. Opus 91 is a 52-rank mechanical key action organ, which means that there are mechanical links that directly connect each of the keys to valves under the pipes. This kind of organ was created before the advent of electricity and generally is preferred among premier organists. While this is Dobson Organ’s first overseas project, the company had built 90 organs since 1974 before creating “Opus 91” for Merton College. “We’ve never built the same organ twice,” said Dobson, the company’s president and artistic director. 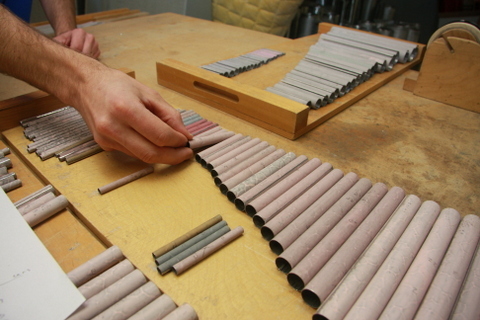 Organ building, like many centuries-old crafts, is becoming increasingly rare. Companies like Dobson’s are even fewer, with an estimated half dozen nationwide. As I look back at the last 40 years of my life, organ building was a good career for me. It gave me a chance to be creative and work with many creative people over the years. I’ve also had the chance to travel and see and do an almost unimaginable variety of things that I realize have made my life a very satisfying one. Dobson grew up on a farm south of Lake City, where he learned about woodworking from his father, a skilled carpenter and cabinetmaker. While attending Nebraska’s Wayne State College, studying art and industrial education, Dobson tinkered with an old, non-working pipe organ in the college administration building. By the time he left, it was playable. This inspired him to start his own company, which started as a two-man operation and has grown to include 19 skilled employees. They include voicers, pipe makers, cabinetmakers and general organ builders who work in a 1890s-vintage shop located on Lake City’s city square. The company has built about 20 new organs for customers in Iowa, including the Lake City Union Church, Westminster Presbyterian Church in Des Moines and the First Reformed Church in Orange City. The firm has restored an additional 20 organs across Iowa. Dobson’s reputation has also earned the company acclaim across the United States. Some of the company’s largest projects include the organs at the Cathedral of Our Lady of the Angels in Los Angeles, the Kimmel Center for the Performing Arts in Philadelphia and St Thomas’ Church, New York City. “I think every day is more exciting,” Dobson said. Even though the economy and a changing cultural and religious climate are great challenges for us in the organ building field the fact is we’re still able to be creative and work with good people. What could be better than that? Dobson organ pipes can be as tiny as a pencil to produce the higher notes, and up to 40 feet tall (with pipes weighing 500 pounds) to produce the low notes. Pipes can be made of metal or wood. As shown here, the pipes’ coating, which keeps the solder on the seams, is washed off to expose the shiny pipes once the process is complete.